Here are some of the most frequently asked questions about asphalt parking lot repair, maintenance and sealcoating. If you have a question that hasn’t been answered, please ask a question in the comments box below or Contact Us Here! Why Sealcoat An Asphalt Parking Lot? How Much Does Seal Coating An Asphalt Parking Lot Cost? How Soon Should A Parking Lot Be Sealed After Installation? How Many Coats Should Be Applied? Which Application Is Better Spray or Squeegee? 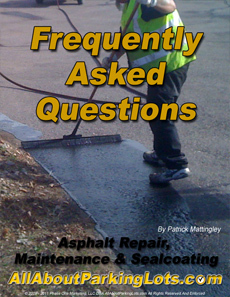 How Thick Is One Application Of Asphalt Parking Lot Sealer? Is Asphalt Parking Lot Sealer Water based Or Oil Based? Will The Sealer Track Into The Building? How Frequent Should Cracks Be Sealed? Will Sealcoating Make My Parking Lot Look New Again?